Shrimps, rice vermicelli, carrot, basil leaves, cucumber, and green leaves wrapped in rice paper; served with homemade peanut-tamarind sauce and topped with crushed peanut. Vegetables wrapped in egg roll skin and deep fried; served with sweet and sour sauce. Deep fried tofu; served with sweet and sour sauce topped with crushed peanuts. Shrimp mixed with grounded pork wrapped in wonton skin and steamed; served with chili soy sauce. Grounded chicken wrapped with wonton skin and deep fried; served with sweet and sour sauce. Homemade seasonal shrimp mixed with grounded pork and deep fried; served with sweet and sour sauce. Batter-coated, deep-fried calamari; served with sweet and sour sauce. Marinated chicken (white meat) on skewer and grill; served with white toast, peanut sauce, and cucumber salad. Deep fried chicken wings sprinkled with salt and pepper; served with sweet and sour sauce. Deep fried sour pork spare ribs; served with fresh ginger, peanuts and Thai chili. Deep fried Thai style sour pork sausages; served with cabbage, fresh ginger, peanuts, and Thai chili. Grounded pork, lemongrass, and onion mixed with Thai curry paste; served with cabbage, fresh ginger, peanuts, and Thai chili. Marinated pork and deep fried; served with homemade spicy sauce. Marinated beef and deep fried; served with homemade spicy sauce. Marinated pork and grilled; served with homemade spicy sauce. Marinated beef and grilled; served with homemade spicy sauce. Marinated chicken with Thai herbs; served with spicy Thai style sauce and sweet and sour sauce. Steamed chicken, crispy fried wonton, boiled egg, lettuce, onion, tomatoes, carrots, and green onion; served with peanut dressing on the side. Your choice of grounded pork, grounded chicken, or grounded beef. Silver noodles mixed with shrimps, calamari, grounded pork, onion, celery, and spicy lime juice. 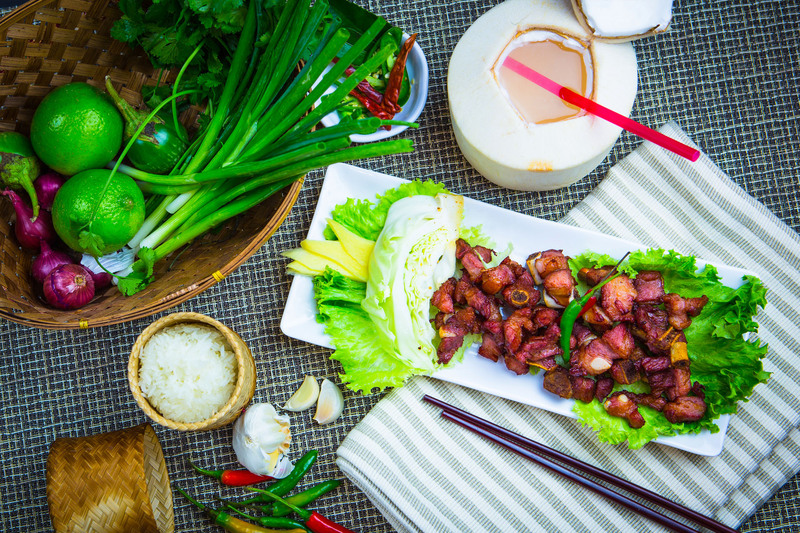 Choice of grilled pork or beef mixed with roasted rice, red onion, green onion, mint leaves, and spicy lime juice. Grilled beef mixed with cucumber, onion, green onion, tomatoes, and spicy lime juice. Sliced sour pork and grounded pork mixed with crispy rice, fresh ginger, peanuts, onion, and spicy lime juice. 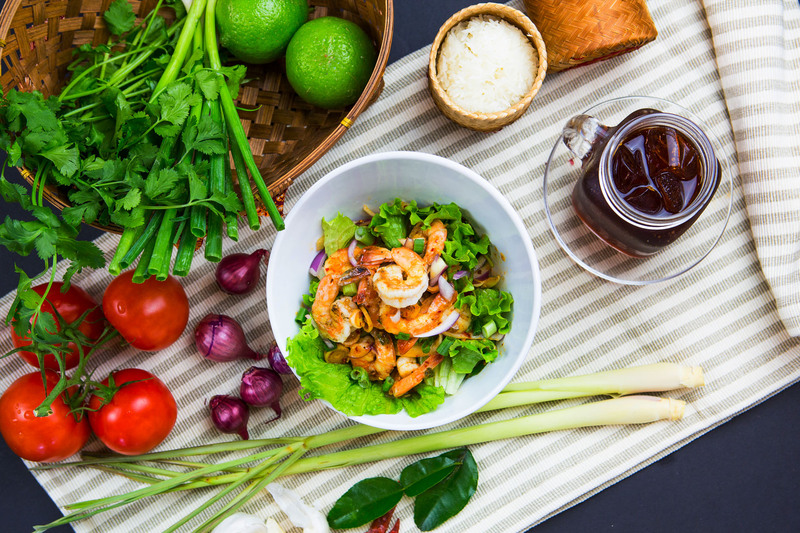 Medium rare shrimps mixed with lemon grass, onion, mint leaves, Thai chili paste, and spicy lime juice. Raw shrimps topped with garlic and spicy lime juice; served on a bed of sliced cabbage. Steamed fish filet; served with garlic and chili lime sauce. Steamed calamari mixed with lemon grass, fresh ginger, celery, onion, green onion, and cilantro; served on a bed of lettuce. Shrimps, mussels, calamari, fish filet, and imitation crab mixed with onion, green onion, tomatoes, and spicy lime juice. Bamboo shoots mixed with Ya-Nang young leaves, roasted rice, cilantro, grounded dried chili, and fermented fish paste. Your choice of raw blue crab or salted black crab mixed with fresh green papaya, tomatoes, long beans, Thai eggplant, garlic, fresh chili, and lime juice. Your choice of raw blue crab or salted black crab mixed with fresh green papaya, Thai rice vermicelli, Thai eggplant, long beans, tomatoes, fresh chili, garlic, and lime juice. 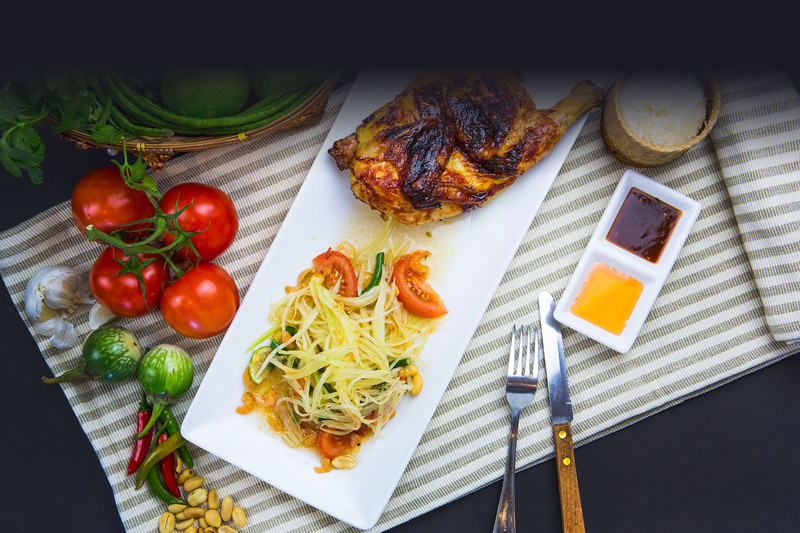 Your choice of raw blue crab or salted black crab mixed with fresh green papaya, Thai rice vermicelli, Thai eggplant, pickled mustard, bamboo shoots, mint leaves, bean sprouts, long beans, and lime juice. Fresh shrimps mixed with long beans, tomatoes, fresh chili, and Thai eggplant. Raw blue crab, salted black crab, and shrimps mixed with green papaya, tomatoes, long beans, Thai eggplant, fresh chili, garlic, and lime juice. Fresh green papaya mixed with dried shrimps, tomatoes, long beans, peanut, fresh chili, garlic, and lime juice. Fresh green papaya mixed with salted egg, dried shrimps, tomatoes, long beans, peanut, fresh chili, garlic, and lime juice. Fresh green papaya mixed with crispy grounded catfish, dried shrimps, tomatoes, long beans, peanut, fresh chili, garlic, and lime juice. Fresh green papaya mixed with crispy pork, dried shrimps, tomatoes, long beans, peanut, fresh chili, garlic, and lime juice. Green papaya mixed with flour, then deep-fried; served with dried shrimps, long beans, tomatoes, peanuts, fresh chili, garlic, and lime juice on the side. Fresh green papaya mixed with shrimps, long beans, tomatoes, fresh chili, garlic, and lime juice. Apples, grapes, strawberries (seasonal), and tomatoes mixed with dried shrimps, long beans, peanuts, garlic, and lime juice. Corns mixed with dried shrimps, long beans, tomatoes, fresh chili, peanuts, garlic, and lime juice. Green mango (seasonal) mixed with dried shrimps, tomatoes, long beans, fresh chili, peanuts, garlic, and lime juice. Red curry paste, coconut milk, bamboo shoots, sweet basil leaves, and bell pepper. Green curry paste, coconut milk, bamboo shoots, sweet basil leaves, and bell pepper. Yellow curry, coconut milk, potatoes, carrots, onion, and bell pepper. Masamun curry paste, coconut milk, peanuts, potatoes, onion, and bell pepper. Panang curry paste, coconut milk and bell pepper. Roasted duck, red curry paste, coconut milk, pineapple chunks, tomatoes, bell pepper, and sweet basil leaves. Tiny shrimps mixed with flour; deep-fried and served with sweet and sour cucumber sauce. Pan-fried mussels scrambled with egg, bean sprouts, and green onion and sweet chili sauce on the side. Grilled pork, roasted rice, red onion, green onion, mint leaves, and cilantro with spicy lime juice. Spicy spaghetti pan-fried with clams, basil leaves, garlic, bell pepper, and fresh chili. Small rice noodles pan-fried with crispy pork, dried shrimps, egg, bean sprouts, green onion, crushed peanut, and dried chili. Jasmine rice stir-fried with shrimp paste; served with dried shrimps, sweet pork, egg, green apple, onion, and dried chili. Jasmine rice stir-fried with fermented fish sauce, egg, green bean, and carrot; served with dried shredded pork, salted egg, onion, and fresh chili. Crispy grounded catfish served with green apple, chili, onion and lime juice on the side. Steamed mussels served with chili lime sauce. Raw blue crab mixed with fresh chili, lemon glass, fresh ginger, garlic, cilantro, green onion, red onion, and lime juice. Raw blue crab mixed with long beans, tomatoes, fresh chili, garlic, black crab paste, and fermented fish paste. Grounded pork mixed with grounded dried chili, roasted rice, lime juice, cilantro, and green onion, then deep-fried. Grounded duck mixed with dried chili, roasted rice, cilantro, green onion, and lime juice. Pork liver mixed with grounded dried chili, roasted rice, green onion, cilantro, and lime juice. Crab meat in house special curry sauce, served with Thai rice vermicilli, bean sprout, pickled mustard, fresh vegetable and a boiled egg. Kale with crab meat in house special curry sauce, served with choice of Thai rice vermicilli, rice vermicilli or jasmine rice. Spicy grounded fish in anchovy curry sauce, served with Thai rice vermicilli, bean sprout, pickled mustard, fresh vegetable and a boiled egg. Deep fried whole trout, served with green apple, onion, chili and lime juice on the side. Mixed vegetables stir-fried with garlic and oyster sauce. Chinese broccoli stir-fried with garlic, chili, and oyster sauce. Thai style omelet pan-fried with seasoned grounded pork. Sliced fresh ginger stir-fried with mushrooms, onion, green onion, carrot, and garlic. Shrimps dipped in batter and deep fried; coated with tangy orange sauce. Shrimps or Chicken dipped in batter and deep fried; coated with tangy orange sauce. Pineapple chunks stir-fried with cucumber, tomatoes, onion, bell pepper, and sweet and sour sauce. Holy basil leaves stir-fried with bell pepper, chopped green bean, garlic, and chili sauce. Eggplant stir-fried with bell pepper, sweet basil leaves, garlic, and chili sauce. Stir-fried garlic and pepper; served with steamed broccoli and carrot. Sautéed green bean with red curry paste. Cashew nuts stir-fried with dried chili, onion, green onion, carrot, bell pepper, and chili paste. Silver noodles pan-fried with egg, onion, green onion, tomatoes, cabbage, carrot, celery, mushrooms, and baby corn. Clams stir-fried with chili paste, sweet basil leaves, garlic, and chili sauce. Choice of steamed cat fish or deep fried catfish stir-fried with Thai eggplant and curry paste. Choice of soup or dry with egg noodles, roasted duck, B.B.Q. pork, shrimps, grounded pork, green onion, and cilantro. Choice of soup or dry with egg noodles, sliced B.B.Q. pork, bok choy, green onion, and cilantro. Wonton skin wrapped with seasoned grounded chicken, slice B.B.Q. pork, bok choy, green onion, and cilantro. Choice of noodles; choice of soup or dry with fish balls, grounded pork, imitation crab, calamari, bean sprouts, green onion, and cilantro. Choice of noodles; choice of soup or dry with fish balls, grounded pork, imitation crab, calamari, bean sprouts, green onion, cilantro, dried chili, crushed peanut, and spicy lime juice. Choice of noodles with assorted seafood, mushrooms, and bean sprouts in spicy and sour Tom Yum soup. Choice of noodles with sliced pork or beef and meat balls in house special soup. Jasmine rice stir-fried with egg, tomatoes, onion, and green onion. Jasmine rice and combination of pork, chicken and shrimps stir-fried with egg, tomatoes, onion, and green onion. Jasmine rice stir-fried with assorted seafood and spicy Tom Yum paste. Jasmine rice stir-fried with assorted seafood, Thai curry paste, basil leaves, onion, tomatoes, and fresh chili; topped with salted egg. Jasmine rice stir-fried with holy basil leaves, chopped green beans.garlic, and chili. Jasmine rice stir-fried with curry powder, pineapple chunks, egg, raisins, cashew nuts, tomatoes, onion, and green onion. Jasmine rice stir-fried with Chinese sausage, egg, tomatoes, onion, and green onion. Jasmine rice stir-fried with crab meat, egg, tomatoes, onion, and green onion. Roasted duck and Chinese broccoli with gravy sauce over rice; served with black soy sauce on the side. Fresh water shrimps and squid stuffed with minced chicken, boiled egg, and egg noodle in creamy Tom Yum soup (Spicy and sour soup). Pork feet, galangal, lemon grass, kaffir lime leaves, onion, green onion, chili, and spicy lime juice. Chicken feet, galangal, lemon grass, kaffir lime leaves, onion, green onion,chili, and spicy lime juice. Pork ribs, galangal, lemon grass, kaffir lime leaves, onion, green onion, chili, and spicy lime juice. Spicy and sour soup with a combination of shrimps, fish filet, calamari, mussels, and imitation crab, fresh ginger, lemon grass, basil leaves, chili, and lime juice. Small rice noodles pan fried with egg, bean sprouts, green onion, crushed peanut, and special homemade sauce; topped with crab meat scramble egg. Small rice noodles pan fried with egg, tofu, bean sprouts, green onion, crushed peanuts, and special homemade sauce. Flat rice noodles pan fried with basil leaves, green bean, tomatoes, mushrooms, onion, and spicy garlic sauce. Spaghetti pan fried with basil leaves, green bean, tomatoes, mushrooms, onion, and spicy garlic sauce. Flat rice noodles pan fried with egg, Chinese broccoli, and black soy sauce. Flat rice noodles pan fried with egg, green onion, and radish; served on a bed of lettuce. Egg noodles pan fried with mixed vegetables. Stir-fried flat rice noodle; topped with Chinese broccoli, garlic, and gravy sauce. Thai coconut ice cream topped with crushed peanut. Deep fried mashed banana wrapped with spring roll skin; garnished with whipped cream and chocolate sauce. Lacha Somtum restaurant, authentic north eastern styled thai food located on a busy street Hollywood blvd. Los Angeles, CA.